COLLEGE STATION , TEXAS, UNITED STATES, April 8, 2019 /EINPresswire.com/ -- A team of air quality and health researchers led by the Texas A&M Transportation Institute (TTI) has created a first-of-its-kind, county-by-county interactive heat map and city-by-city table detailing the distribution of childhood asthma due to traffic-related air pollution across the United States. One of the principal findings is that asthma cases attributable to traffic-related air pollution dramatically decreased over a 10-year period. A research paper, “Traffic Related Air Pollution and the Burden of Childhood Asthma in the Contiguous United States in 2000 and 2010,” detailing the findings has been accepted for publication in the peer-reviewed journal Environment International. 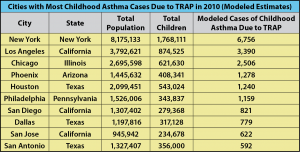 TTI estimates there were more than 140,000 asthma cases due to TRAP in the United States in 2010. More than 80 percent of children with TRAP-induced asthma live in urban areas. Low income households are especially vulnerable.